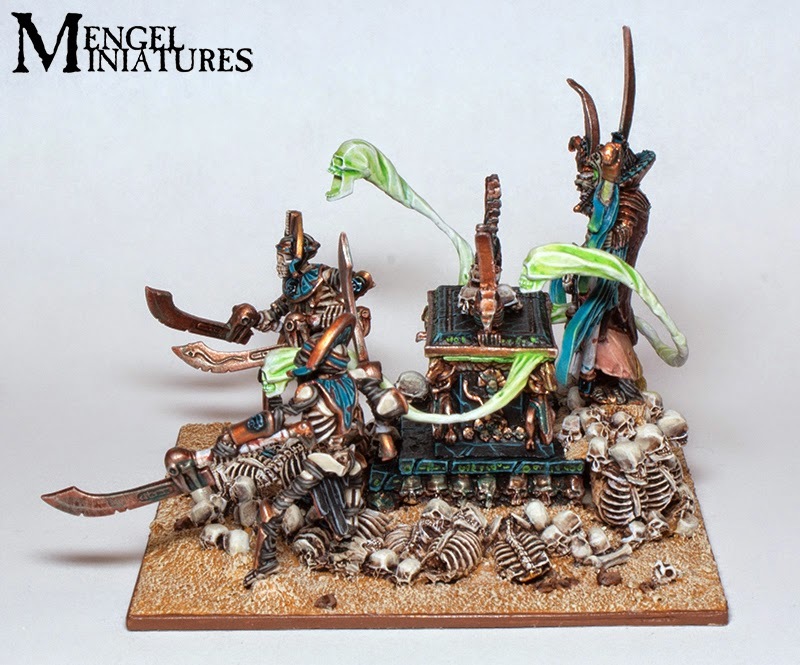 Mengel Miniatures: Building a Better Casket of Souls: Finished! Building a Better Casket of Souls: Finished! 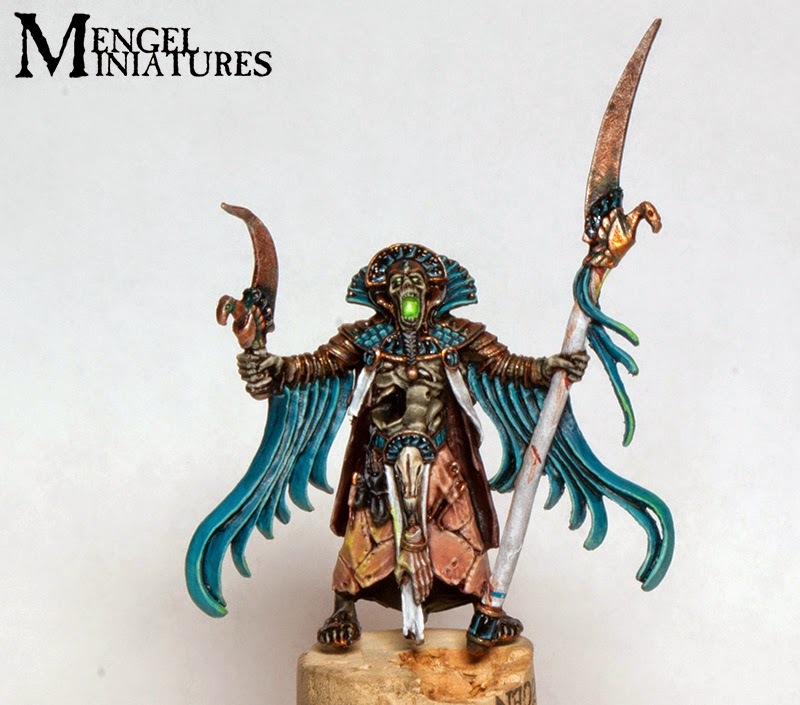 For those of you familiar with some of my articles on Bell of Lost Souls, you'll know that I occasionally have an article titled "Building a Better" where I try and improve on one of GW's existing sculpts. This is the final part of my take on the Casket of Souls. It's done, finally! I knew this model was going to take a long time to paint and that's part of why it took me two years to finally start on it after I bought it. I am very happy with how it turned out. The liche priest had plenty of obstacles to overcome while I was painting. I have always loved the sculpt, but there are just a few parts that bother me. I wasn't sure what to do with the flayed skin kilt and overcoat since I feel like it doesn't really fit the rest of the Tomb King aesthetic. In the end I just decided to go with the flow and paint it how it was intended. He also has some weird hair stuff sculpted behind his first headdress, which I still have no clue what it's supposed to be. This was just painted black with a quick highlight. One of the hardest choices was deciding how to apply my turquoise and white scheme to the liche. With the long strips of cloth on his arms I ran the risk of doing a striped effect with white and blue, but decided just to lean more heavily towards the blue side of my scheme. You can see a step by step on how I painted the skin here. I based the recipe off of a an old 'Eavy Metal painting guide from White Dwarf when the Tomb Kings were first released for 6th edition. I changed it a little by not including a Flesh Wash (which now would be Riekland Fleshshade) step, but this was due to me forgetting it instead of opting not to. On the next model with mummified skin I might try the original paint recipe and compare the two. 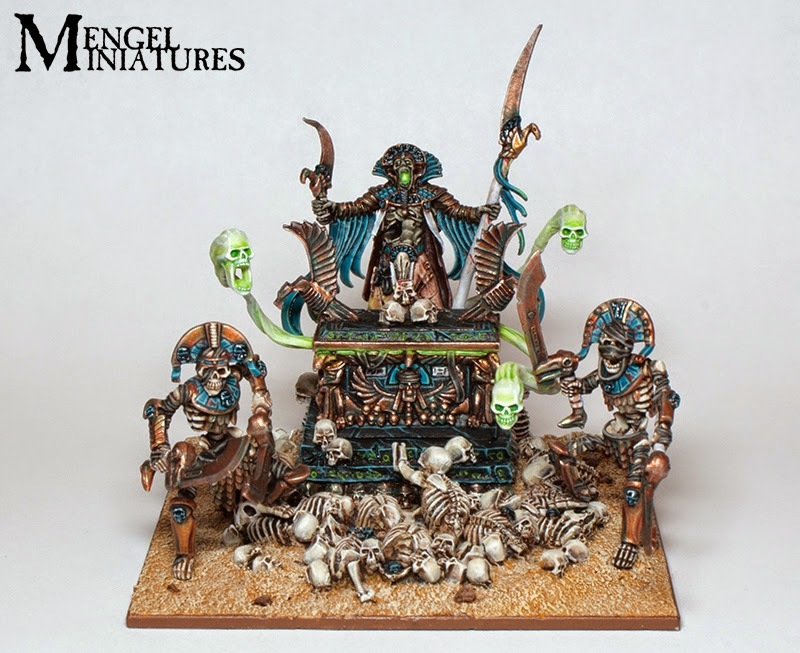 After I had finished the whole model I placed him on the Casket of Souls to see where he aligned with the ghost skulls. Using this as my basis I used watered down Scorpion Green to add an OSS light effect on to the priest. I gave all the metal on him some verdigris in the same manner as the Tomb Guard, but toned it down a bit. I did this so it looks like his armor and jewels are cared for a little more then the average warrior. 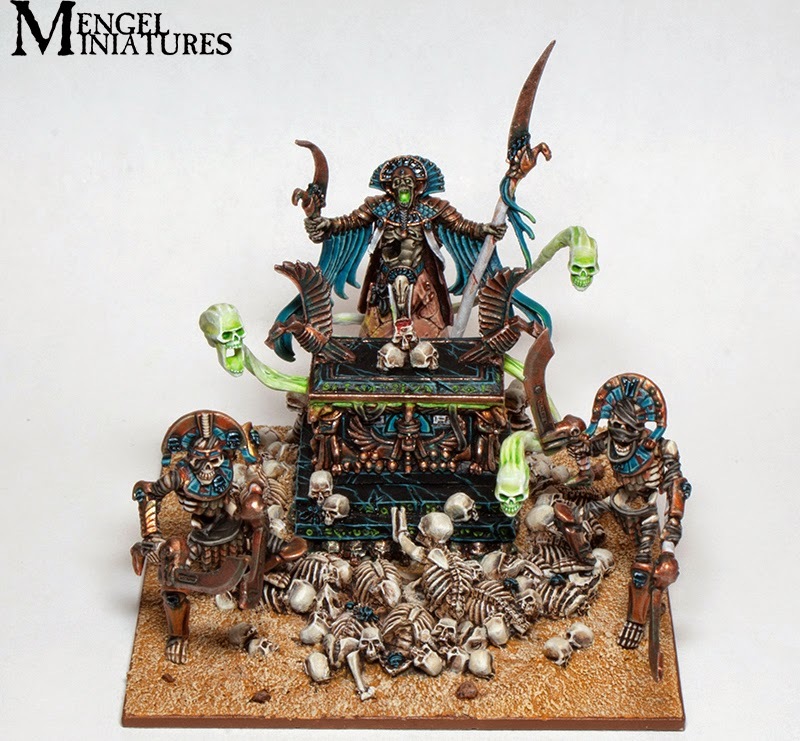 I used this as an opportunity do the same to the gold on the casket so it ties in with my army. I also added a few skulls and mounds of sand to the back of the base to make it more visually interesting and balance the model more. The last thing I did was fill the giant hole in the back of his throat. This helped make the glow effect in his mouth more cohesive. Well now that it's all done I hope you enjoyed the ride and seeing how this progressed over the weeks. I may still add some blood effect on to his sacrificial knife, but besides that I'm on to the next thing. 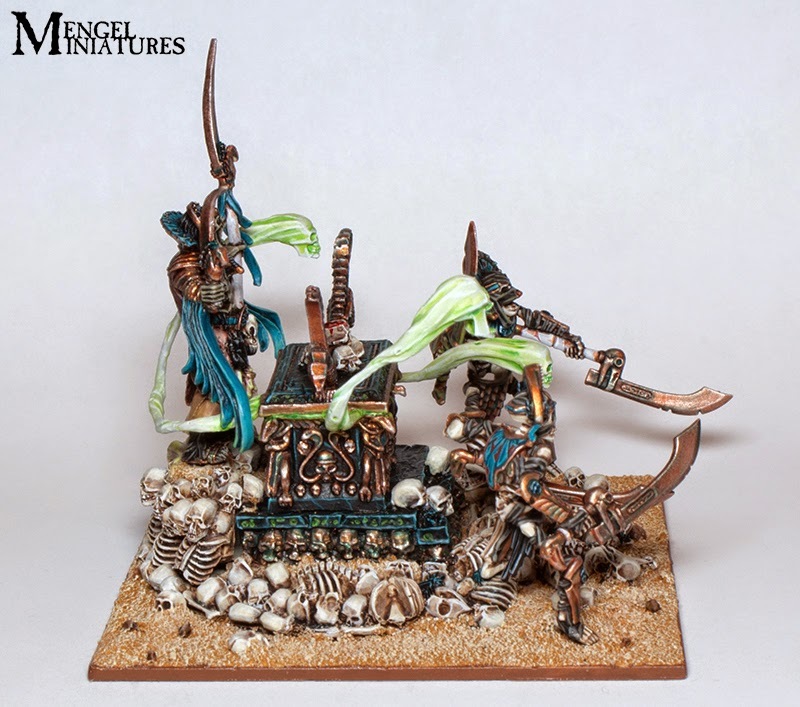 With Armies on Parade approaching fast it's a safe bet to assume it with be something else from the sands of Nehekhara. Be sure to vote for it on Cool Mini or Not here.